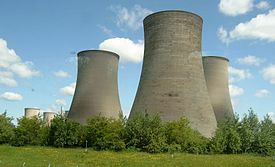 Cooling towers are heat removal devices which are used to transfer heat from cooling water to the atmosphere. Animation shown at the University of Michigan website will help you to understand more about hyperbolic stack-natural draft cooling towers. How a cooling tower works? They work in two ways, first using evaporation of water or by using conventional method of heat ex-changer.Video given below has more explanation about it. Increasing Cooling Tower Water Efficiency :By increasing water efficiency of tower, we can save tons of gallons of precious fresh water. CFD Prediction of Cooling Tower Drift :The CFD (computational fluid dynamics) program predicts plume rise, surface concentrations, plume center-line concentrations and surface drift deposition within the bounds of field experimental accuracy. Cooling Tower Analysis : Analysis by a team about the performance of four cooling towers and cooling done by them.